Invention of the organ. Ctesibius and the hydraulic organ. Before the organ there were river reeds and human breath. Mankind had created a flute and also a sort of primitive reeded instrument, the Indian "magudi", distant ancestor of the clarinet. These instruments come from the dawn of time, heralds of playing "by mouth" and "with reeds" and are the predecessors of the organ. It was Ctesibius, a Greek engineer living in Alexandria about 300BC, who was the first to invent a machine which replaced human breath in order to made flutes sound. A bell immersed in water supplied the air under pressure : The Hydraulos, or the hydraulic organ was born. But this cumbersome and untransportable system was quickly replaced by a system with bellows pumped by the musician himself. The new instrument was developed and widely used in Greece and ancient Rome. With its fifteen or so reed "pipes" of various lengths, and a system of wooden pulls, this very sonorous organ, was used for heathen holidays and at the circus for the games. 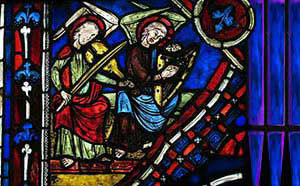 From the middle of the eighth century, the organ began to spread in the west in abbeys, churches, and cathedrals. A keyboard with a mechanical action had replaced the pulls. The organist played with both hands while a third person pumped the bellows. Pipes of different shapes and dimensions were introduced, with their new tones. The great organ became established in the heart of the church, with a position for the choir beside it at the edge of the gallery, which allowed the first musical couplings between the two. Today, a full organ can contain between 1000 and 30,000 pipes! HOW DOES AN ORGAN WORK ? The organ has evolved, but the principles of its function have not changed greatly over time: A blower or an electric turbine feeds the primary reservoirs which store air under pressure. This air is then transferred by a system of conduits, to the pipes which are grouped in "stops". The pipes rest on a "chest", which also shelters the structures from the blower. The "register stops", the keyboards and pedals situated at the "console" allow the control - by the transmission system - of the air valves. These control the emission of air into the pipes: which willremain mute or will "speak" as the stops are pulled or not and the notes played or not. There are more than a hundred different organ stops, but only two main categories : "Flues" and "Reeds"
Bass and mixed stops use the principle of the recorder. Air is passed through a slit, this stream of air or "light" as it is known strikes a "bevel", a piece of lead which creates the sound. The column of air inside the pipe begins to resonate. According to the laws of acoustics, the longer the pipe, the slower the frequency of vibration and the lower the pitch of the note that will be emitted. The "flue" stops produce a sweet flute-likesound. They are either made of pewter or of wood; the wooden ones have a square shape. "Narrow" scale stops: Gambas and Salicional with their sharp sounds are reminiscent of those stringed instruments. Mutations and Mixtures (compound stops) : quinte (now Open Twelfth), Seventeenth, Nineteenth (or super quinte), cornets... By harmonizing on the fundamental, they lighten their timbres in the way that a sunbeam is filtered by the colours in stained glass. "Reed" stops work like a clarinet. Air vibrates a reed. The timbre is brilliant, rich in harmonics and gives force and virility to the organ's sound. These stops are pewter and include: trumpet, clarion, bombards, horizontal trumpet, crumhorn, clarinet, oboe, vox humana, regal etc. The romantic organ sought to substitute for the orchestra. The plein Jeu had disappeared and it aimed at a symphonic aesthetic well in keeping with the necessities of the era. The romantic organ is marked with the imprint of the famous organ builder Cavaillé-Coll, who sweetened, perhaps a little too much, the distinguished and austere character of the classic organ. The great merit of this romantic organ-builder was his improvement of all the mechanics and the organ was made easier to handle. The organ is strictly associated with the church, so much so that a sacred character has almost become associated with the instrument. Indeed rare are the religious edifices which do not possess their own organ. The names of Couperin, Clerembault, Nicolas de Grigny, Frescobaldi, Padre Soler, Handel, Purcell, Buxtehude, BACH, Caesar Franck, Fauré, Saint Saens, VIERNE, ALAIN, DURUFLÉ, Messiaen have marked the beautiful history of the organ. Johann Sebastian BACH is the uncontested master of the organ. A remarkable virtuoso, he forced the instrument to evolve, contributing to the optimization of the classic organ. BACH wrote in forty years innumerable pieces for organ : preludes, fantasies or toccatas and fugues, concertos, sonatas, chorals... Uncontested genius of Classical music, he discovered how to bring toevery musical form an unequalled perfection. 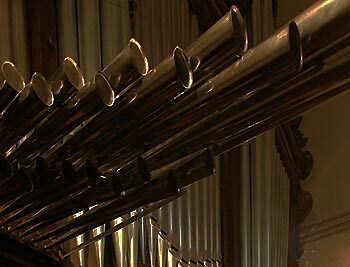 Let us leave behind the traditional pipe-organ and discover the advances of technology. Certainly this new discipline is still in its debut, and one cannot compare an organ or piano with hundreds of years of experience behind it with a sound synthesis which has no more than fifty. However, it is evolving very rapidly, every year there is something new, and we shouldn't ignore tomorrow's instruments. The term "digital" indicates that the instrument uses, to create its sound, a system based on information, comparable to that of the computer. That marks a huge difference between it and the classical analogue organs of the preceding generations.The conceptual principle of the digital organ is that of digitizing the actual sounds created by a pipe organ using a process called sampling. The organ records in its memory these sound samples, and canrecreate them when the organist plays. The sound recreation is made by a harmonic synthesis (the sample is analyzed as a list of numbers which change over time). The organ's memory encodes all these coefficients and then synthesises the sound by means of electronics specially conceived to generate harmonics), by reading the stored samples on a long loop (by changing the frequency of the restored version of the sampled sounds, successive transposition will restore the full range of notes. Only one need be sampled for its sound and that will allow the creation of the others). WHAT IS A SYNTHESIZER ? A synthesizer is an electronic musical instrument, provided with a keyboard and allowing, through use of filters, the creation or modification of sounds. Today's synthesizers are digital and use sampling for their sound synthesis. In the 70s there appeared in the market, instruments which were going to revolutionize music. The studio "sharks" (Good musicians specialized in the recording sessions) viewed with a jaundiced eye the revolutionary machine which threatened to replace them : the synthesizer. One remembers first the Arp, Moog, Synclavier, Oberheim and Prophet-5 synthesizers, which were dreamed of by so many musicians! Towards the 80s Fairlight and Emulator made the first move towards the digital sampling. In 1983, the DX-7 employed a system of sound synthesis using FM and algorithms. Its enormous success marked the beginning of the end for analogue synthesizers. But every year saw a new development, the world of synthesised music evolved at a prodigious speed. In 1987 the first synthesizers with pre-sampled sounds appeared: Roland's D-50, the Korg M1 and Kurzweill's K-2000. Then Workstations started to appear, integrating sequencers, reverbs and various effects, such as the SY YAMAHA. The 80s saw the application by all manufacturers of the standard MIDI: This system of revolutionary interface allowed various machines to communicate amongst themselves, of to program "effects" such as reverb and the others, and to control one or several synthesizers from a sequencer or nowadays a computer. At the beginning of on 1994, Yamaha invented a new technology with its VL-1: synthesis by physical modelling, which models sound dynamically according to their level. This process requires extremely complex operations and so the processors has to be very powerful and very fast. With a clarinet, for example, it will be able to calculate the evolution of the various soundwaves in the mouthpiece of the instrument, in the two parts of the body, in the bell, and even take into account the noise of the keys! 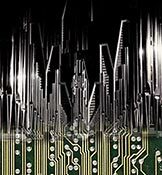 The synthesizers of the future which use of this type of synthesis and will eventually be able to more closely mimic the tones of the authentic instruments. Jean-Christian MICHEL's "Quartet with Organ"
"Sounds have always fascinated me. As a child I encountered music in the multicolor twilight of churches, where I went to find this magic every time I could. Music quickly took me over and transformed my life. The smells of wax and incense appear from the past, I see again the organ, above me and magestically throned in the gallery. The grand brass sound, the gentle whispers of the pipes and the great depth fascinate me. Its apparent and mysterious inaccessibility entrall me. I am dying to know more. One day, taking my courage in both hands, I go up the stairs to join the organist : it is he who guides me through my first steps in music and places my fingers on the keyboard for the first time. Such care from this man, he plays music and has known everything. And I, small child as I am, burns with the ambition to learn and he understands this too. Later, I studied the clarinet at the conservatoire. Then, at the height of my adolescence I discovered Jazz : I fervently loved this music. One day, I had the idea to ally Jazz and Sacred music, bringing together the clarinet - my instrument - with the majesty, power and variety of timbres of the church organ. Thus was created my first "Quartet with organ". The organ assured a full orchestra support, but with its own colour and light. The bass and the percussion brought their rhythmic beat. So, magnificently bathed in this stream of harmony, the clarinet could express itself freely within the lively playing of the organ! 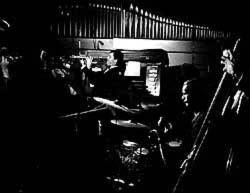 This is how my first "QUATUOR WITH ORGAN" was born with Monique THUS at the organ, and our old friend Kenny CLARKE with whom we played and recorded for more than10 years.